There is a widely held dream of jetting off to the USA to travel from coast to coast in a beaten up old car with a couple of mates, listening to country music and having an all-round blast. In reality the car breaks down, you fall out with someone along the way and run out of money in New Mexico. Well, not for me and my pops, we had different plans. We decided a father-daughter road trip along the West Coast of the United States would be the way to go: no beat up car, no singing Wonderwall around the fire; just some excellent bonding time. Part one of the trip began in the City of Angels, Los Angeles. I fell in love with the city the moment we arrived; the beautiful weather, rolling hills and sprawling suburbs make for excellent explorations. And, although the Hollywood glitz and glam may have faded over the years, with a little help it’s easy enough to find. We were only in town for a few days, so in order to see as much as possible we decided to purchase a 24-hour Go City Card. Go City allows you to pay in advance (and save your pennies) for a one, two, three, five, or seven day pass and offers access to as many of the attractions in that city that you can fit in. We loved it so much we also used them in Las Vegas and San Francisco! With only a one day pass we didn’t spend any time messing around, starting the day at the Warner Brother’s Studio Tour. As one of the most renowned film studios in the world, it is a tour that lives up to its reputation, with each group scooped up by their own guide before being escorted round the lot. Visitors will see everything from Grease Live’s Rydal High, to the infamous Central Perk, as well as the sound stages where the likes of Rebel Without A Cause and Ocean’s Eleven came to life. Walk through the Ellen Studio, before exiting through a fantastic exhibition filled with all sorts of interactive features - I got to ride a broomstick and pretend I was a Hogwarts student for just a second. 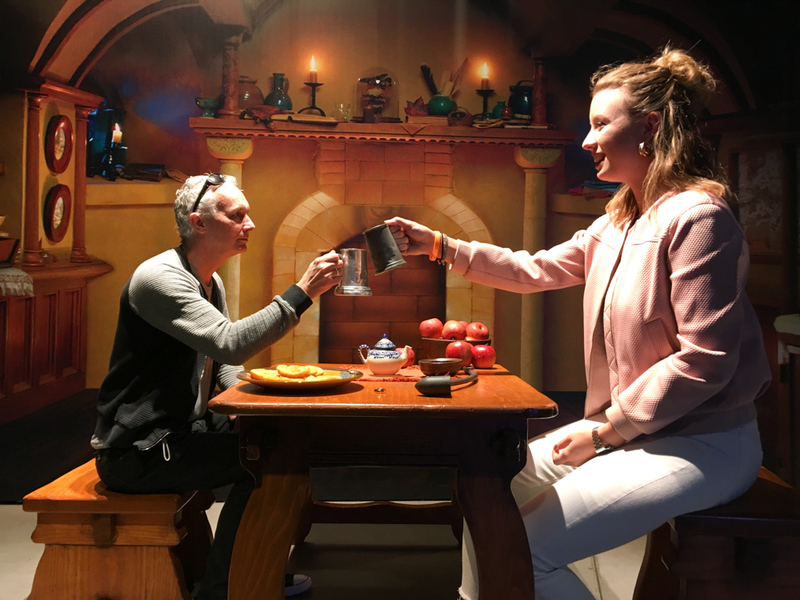 Next was a walking tour around the Sony Studios, which featured an immersive viewing of the soundstage which once was home to the Yellow Brick Road in the 1939 film The Wizard of Oz. We followed our day of studio tours with a trip up to Griffith Observatory. Not only does Griffith Observatory provide a glorious view of LA but also is a must-do attraction for its famous Samuel Oschin Planetarium shows (an absolute steal with ticket prices ranging from $3 -$7). We headed out of the “Centre of the Universe” show to join the crowd of people watching the sunset, illuminating the Hollywood sign in a dance of golden orange and pinks. It was the perfect way to end our first day on the West Coast. In the morning we set off for a jaunt to the Original Farmer’s Market, established in 1934, to grab one of Bob’s famous coffees and a doughnut. Sitting among the hustle and bustle of the market, with the historic shop fronts filled with all sorts of everything, it was easy to see why the market remains open and is so popular to this day. Fuelled by coffee, we made our way to Universal Studios Hollywood to pick up our tickets and our ‘front-of-line’ passes. The park has a brilliant app that not only gives you a great map of the rides but also features a waiting time indicator so you can figure out where to base yourself on the move. It was packed on this sunny Saturday and upgrading our tickets to include the front of line passes enabled us to skip all the queues, giving us time to go on every ride at the park. We made our way round, starting with the Despicable Me Minion Mayhem and the Walking Dead Attraction, bumping into Shrek, Donkey and even a Raptor on our travels. It was so much brilliant fun, especially for an adrenaline junkie like me, and even dad (who’s not too keen on heights) enjoyed himself! 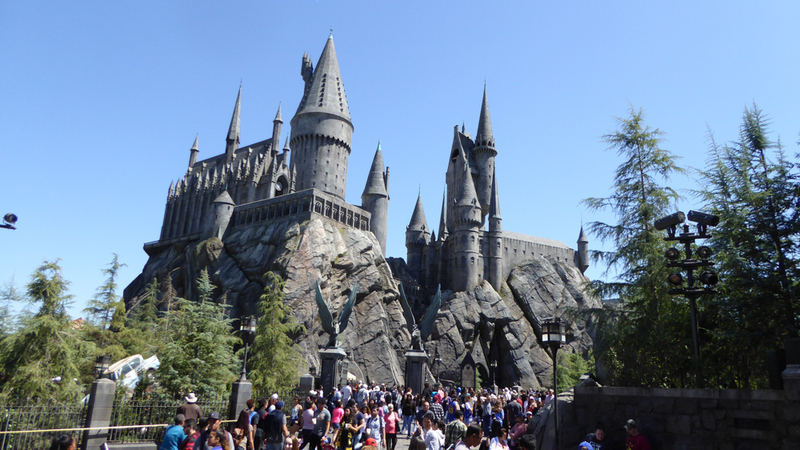 The highlight of the day had to be the Wizarding World of Harry Potter, where you travel from California all the way to the snowy lanes of Hogsmeade, which is filled with magical shop fronts, the Hogwart’s Express and two mind boggling rides. Even queueing is exciting as you make your way through the Hogwarts where the paintings talk, Harry, Ron and Hermione appear in the Defence Against the Dark Arts Classroom and the Sorting Hat sings you a song. 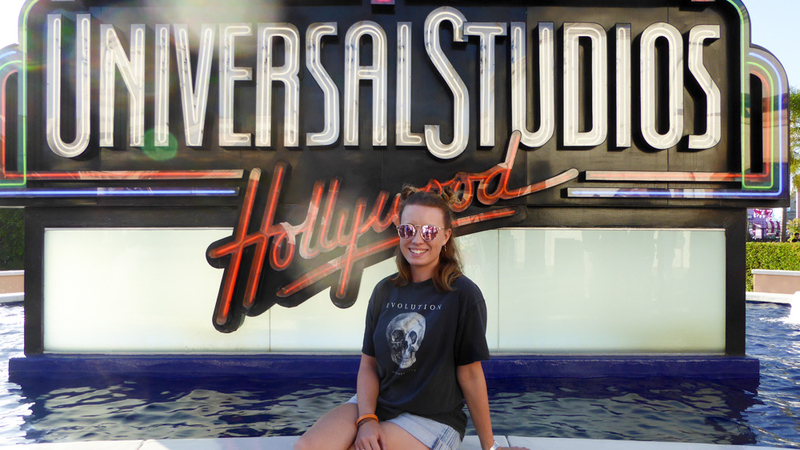 The fantastic thing about Universal Studios Hollywood is there really is something for everyone, and not just roller coasters. There’s the brilliant Special Effects Show, the Studio Tour, which takes you through some of the movie sets used in films such as Psycho and Jaws, and even an exclusive King Kong 360 3-D experience created by Peter Jackson himself. 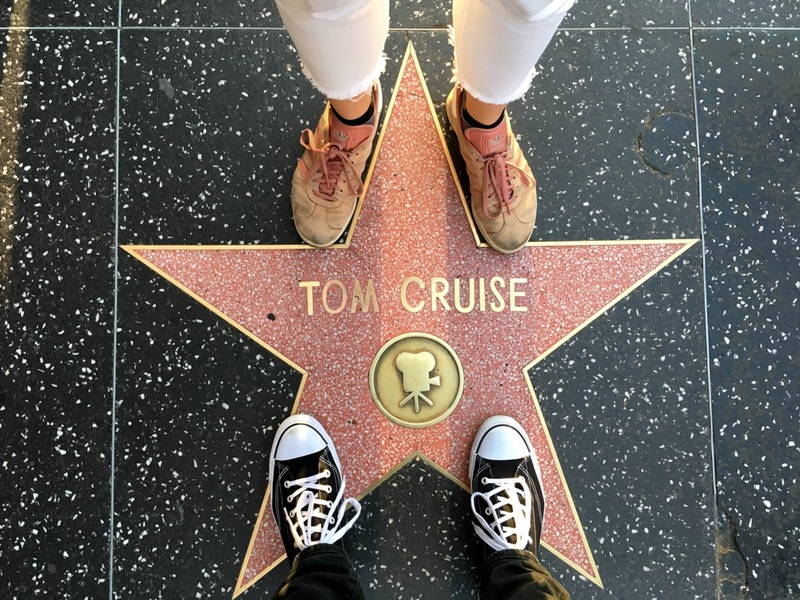 We were running out of time in LA, and as huge movie buffs we knew we couldn’t start the next leg of our adventure without checking out the infamous Hollywood Boulevard. We followed the Walk of Fame, stopping at Alfred Hitchcock and David Bowie (to name just a few) and ended up at Grauman’s Chinese Theatre, home of nearly all 20th century Hollywood movie premieres. 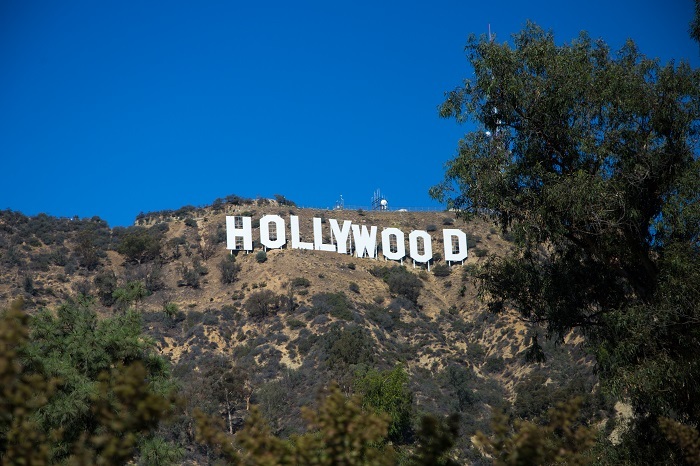 Outside the theatre are the iconic hand and footprints of Hollywood stars the likes of Marilyn Monroe, Gene Kelly, and Doris Day, as well as more recent actors like Will Smith and Robert Pattinson. We ended our time in the City of Angels at Mel’s Drive-In, a 50’s style diner off Hollywood Boulevard with great big burgers and a juke box on every table. However, there was one thing missing. Before we set off on our big drive to Las Vegas we had to get a glimpse of the Hollywood sign. We heard the best way to access the sign was from behind but we wanted to see it in all its glory so we set off towards Deronda Dr where you can park your car among the residents and head out on foot to find one of the great close up photo spots. The first leg of our father-daughter road trip was over and so, with the Hollywood sign behind us we began our drive to Las Vegas. One of the world’s most dynamic and diverse destinations, Los Angeles is comprised of more than 30 diverse neighbourhoods and considered the cultural hub of the Pacific Rim. Home to near-perfect weather, 75 miles of jaw-dropping shoreline, more museums than any other US city and an award-winning culinary scene, Los Angeles presents endless possibilities that keep its more than 47 million annual visitors entertained.